For the past 30 years Red Sail Sports has been synonymous with luxury watersports. But did you also know that Red Sail Sports is making a name for itself as a resort retailer? With seventeen retail stores located in the Caribbean and Pacific you could say that we’ve made quite a splash in the retail market! Most Red Sail Sports shops carry an assortment of T-shirts, casual wear and designer swimwear for men, women and children. Guests will also find gift and sundry items and vacation necessities such as film, cameras and sunglasses. Red Sail Sports has developed its own line of signature suncare products which are available at most retail locations. You may inquire about Red Sail Sports diving and watersports activities at any of our retail locations. for these activities while you shop! Confetti on the Beach is located in the Renaissance Resort shopping area. This boutique carries all the latest fashions in swimwear and cover-ups. In addition, find a selection of beach necessities. Port of Call is located in bustling, downtown Oranjestad. 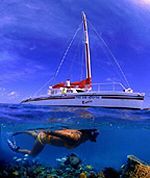 It offers the largest selection of dive equipment found in Aruba. Located at the cruise ship entrance docks it is easily accessible by cruise ship passengers and also by car or public transportation. Find souvenirs and beach essentials as well as men’s and women’s casual wear. Red Sail Sports at the Hyatt Regency in Aruba is situated on the Lobby level of the Hyatt Regency. You’ll find a large selection of tropical vacation wear for men and women. Also shop for swimwear, souvenirs, sunglasses, Cuban cigars and sundries. Shop nightly until 9:00p.m. 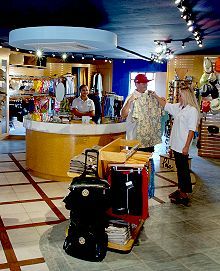 Renaissance Island has a Red Sail Sports retail store and carries swimwear, t-shirts, souvenirs, snorkeling gear and other beach essentials. With its excellent snorkeling spots and relaxing atmosphere a visit to Sonesta Island is a must! 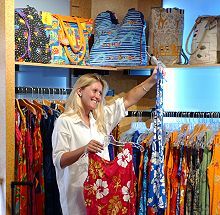 Marriott Resort and Marriott Vacation Club has 2 beautiful stores—Ocean Drive and Island Life. 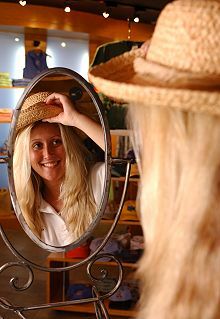 The shops features casual wear for men and women with designer wear including: Tommy Bahama and Jams World casuals. Also shop for a variety of t-shirts, hats, sandals, swimwear, sunglasses and souvenirs.